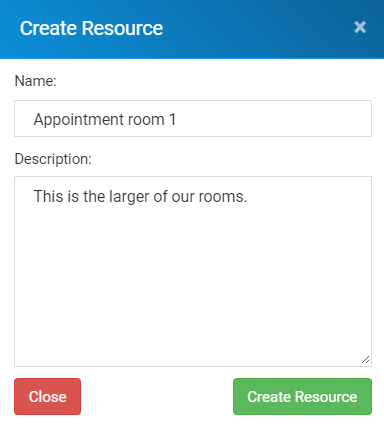 Resources are elements you can add to appointments such as meeting rooms and equipment. We will be developing this feature further to ensure when a resource is booked against an appointment it becomes unavailable but for now this can be used as more of a visual guide. To add a resource, click the ‘add resource’ button to load the following window. It will then appear in the resource list as follows. As with services, to delete a resource click into the resource from the main list and select delete resource.